Construction is planned to start in 60 days and end 18 months later (end of 2011), looking something like this rendering. Wow. Well one of the ugliest parts of the new design is the two driveways to enter and exit the underground parking. And how are they going to disguise the revolting backside of SCPA? Seriously. Am I the only citizen who is irked about the inclusion of a parking lot for a school that sits a block away from a publicly subsidized garage? The side of SCPA along Elm Street is not exactly breath taking either? I hope they leave the bandstand structure alone. Where is the iron flower stand that used to be on Fountain Square???? Have any of you actually been in Washington Park right now? It's actually quite nice. Mature trees, grassy areas, etc. This redevelopment is nice, but it does not take into account the primary reason why this park is not used by anyone for any recreational purpose: the Homeless individuals who live there. There are a number of homeless assistance service providers quite near the park, and honestly if they remain in close proximity I don't know that any amount of renovation will have a positive impact on the park's use. I am not a proponent of simply kicking the homeless out of the park through security or police presence. The service providers in the neighborhood are needed and are helping destitute (and often mentally ill) people. However, there is no denying that it has made this park unusable for most other purposes. Jason, I think the redevelopment DOES address the homeless issue -- the park will be closed off 18 months [I think], starting this summer. No one will be able to use it which, in a way, does kick people out, or at least forces them to find other outdoor spots to hang out. @Radarman I agree, the building design is less than fitting for the neighborhood, much like the monstrosity attached to the Kroger garage on Vine. 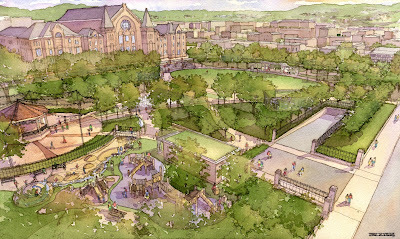 Trinity Flats is an excellent example of how to design a new building for OTR. @VisuaLingual I'm sorry, but I disagree that displacing people for 18 months constitutes "Addressing the issue." I personally don't know how fix it. I live 2 blocks from the park and would love to use it recreationally, but there's no way to do so now because it's simply unsafe. IMO the renovations are a necessary step in OTR's revitalization, but I don't know how we can as a community can provide services to the homeless who so obviously need help AND have a safe, usable green space as things currently stand. Even if they fence off the entire park for the duration of the construction, unless the shelters and food pantries are relocated the park will revert to its current state. It is telling that the rendering shows very few people sitting, or places to sit. Jason, I can't believe that you think it is unsafe. Have you spent any time there? It may not be clean, but i have never felt unsafe there.